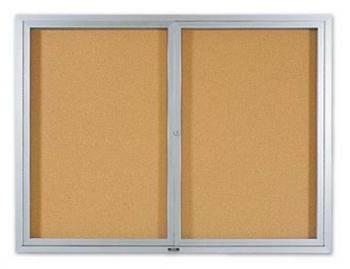 Protect your school's important documents with the Glass Covered Bulletin Board!Some documents deserve the utmost protection. From federal government mandated policies to school district proclamations, you need a way to ensure that no harm comes to these valuable documents. We constructed the Glass Covered Bulletin Board to protect your most valued documents.Made with resilient, pebble-grain natural cork, the Glass Covered Bulletin Board has tempered safety glass doors that are impervious to physical punishment. Satin-anodized aluminum trim adds extra reliability to the Glass Covered Bulletin Board. 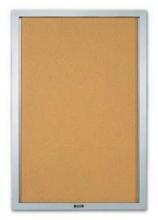 Only authorized personnel will hold the key that opens tumbler pin locking glass door. Continuous piano-hinged doors effortlessly open and close every time you need to place a document into the soft cork surface. 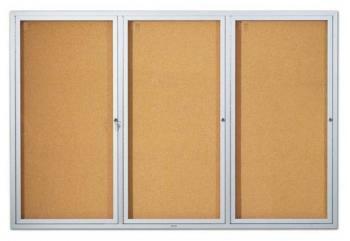 The 3/4 of an inch depth allow you to add thicker documents for public display. 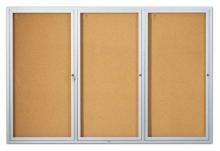 The Glass Covered Bulletin Board is large enough to hold multiple documents.